I have set up various conditions so that the first email is only sent to rajv_1@hotmail.com if the Cost centre code is completed. now the first person in the list which is HR manager 1 should received the email ( which he doesn’t his email address is fritapher@hotmail.com ) they would authorise saying yes or no and then click submit. then the second person would receive an email which would be the Hiring Director (his email is scott.allan@ochrehouse.com )only after the previous person HR have completed the authorised field. which they don't, and so then once the VP has completed yes or no and submits, the CEO receives and email to complete yes or no and submits and then a final email will be sent to this address at present gevangee.desai@ochrehouse.com with details of all the form information. However when I replace all the email address to my own which is Rajvee.patel@ochrehouse.com or my personal one which is rajv_1@hotmail.com it works fine. Please could you advise why this is happening? Also is there a time delay on when people would or should receive emails ? Upon inspecting your conditions, it appears that you are trying to send the autoresponder to the people who edits the submission. Try sending a notification instead. Autoresponders will only work for the original form submitter. For the subsequent editors, only the notifications will work. Let me know if implementing these changes does the trick. I'll be eager to hear about your progress. i created a enw notification emaila nd applied tha to the editors i.e HD, VP and CEO. You will then be redirected to the imported/cloned form in edit mode. 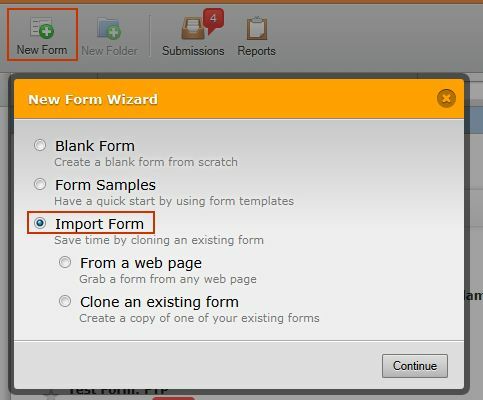 The form is automatically saved in your account as "Clone of [Name of original form]"
Please update us on your progress. We look forward to hearing from you.